The thing we are most often enamoured with is ourselves. To prove the fact, two exhibitions are currently exploring the myriad ways in which we present a sense of self to the world. Both approach this theme in subtly different ways, with the Whitechapel and Saatchi galleries seeing heavyweights of the artistic world, such as Frida Kahlo, Andy Warhol and Gilbert and George, go head-to-head with you, me and a monkey. Although the term selfie was recently crowned Word of the Year 2013 (after an astounding seventeen thousand per cent rise in its usage from the previous year) these exhibitions make it clear that the concept has a much longer lineage. This is dramatically articulated by the Saatchi Gallery’s tech-savvy offering, From Selfie to Self-Expression. Conflating classical painting with contemporary media, Gallery 1 presents us with high-resolution self-portraits of Rembrandt, Van Gogh and Picasso on large iPad-like screens. Adjoining them are mobile phones that allow you to ‘like’ the work displayed, resulting in a brief flash of a large heart over the image. It is an amusing juxtaposition; a sombre Rembrandt temporarily besmirched by an emoji heart. However, the comparison serves to question the ostensible divide between art-world elitism and the populism of modern culture. Whitechapel Gallery, presenting the work of the ISelf collection in Self-Portrait as the Billy Goat, starts its story of self-expression much later, in 1929 with André Breton and the Surrealists. The oldest piece in a show full of contemporary work, the role of photography in self-representation is playfully explored through six black and white photo strips of the artist and his colleagues. Refusing the photo booth’s literalising gaze, they experiment with a range of poses - serious, thoughtful and frivolous - carefully authoring their representation on film. Photography is shown as another stage in the evolution of the ubiquitous selfie; a form of “instantaneous self-portraiture” that allows for conscious self-presentation and performance. Further on in ISelf, Linder’s self-portrait You Search but You Do Not See (1981/2010) explores photography’s ability to record the figurative as well as the literal. A startling large-scale image of the artist’s face, made-up in glamour shot pose but sheathed in plastic, implicitly criticises codes of female representation – particularly in fashion magazines – and suggests such representations are oppressive and detrimental to individual female identity. The Whitechapel exhibition’s strength is in its engagement with critical dialogues such as gender - exploring how they shape identity, social expectations and self-perception. The inclusion of works by Cindy Sherman, Louise Bourgeois and Tracey Emin reiterate this: each piece presenting their identity as grounded in their physicality. Sherman’s series of untitled photographs show her as part of a staged photo-call in different dress but identical pose. The mask-like appearance of her face, alongside her neutral expression and body language, suggest her female identity is a blank canvas onto which predominantly male desires are projected. Similarly, Bourgeois and Emin’s simple gouache drawings show only the boldly sketched, curved outlines of their bodies. Against plain white backgrounds, they depict themselves as physical voids to be filled, maternal vessels for procreation. There is great relish in the exhibition’s anthropological depiction of our need to constantly document our lives, and a sense of absurdity from selfies taken in every conceivable situation and environment. We see people snap themselves in space; perch precariously from the top of a sky-high building; smile underwater alongside the unforgiving jaws of a shark, or grin whilst moments away from being gored by a bull. Our follies are met with either a gasp or a laugh, but always with a degree of affection. The Saatchi exhibition’s interactive and technologically engaging work is a more light-hearted affair in comparison with the relatively sombre Self-Portrait as the Billy Goat. This difference is most pronounced in the darkly cynical title piece by Pawel Althamer - his sculpture a profound fusion of forms. 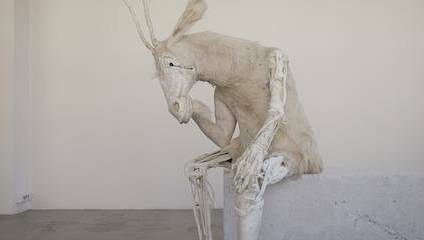 Taking Rodin’s The Thinker (1903) as its template, the lofty, bronze idealisation of man as a higher being is subverted by Althamer, who replaces the man’s head and body with a goat’s flayed skull and torso, exposing the human as a hybrid form of humanist ideals and base animality. While Rodin’s bronze statue implied human permanence – immortality through art – this work shows the notion to be a fallacy through the juxtaposition of a classical sculpted arm, a skeletal leg and a trainer-clad foot; a potent reminder of our very human imperfection. The Saatchi Gallery investigates the boundary between high and low culture through the combination of classical painting and modern technology, while the Whitechapel exhibition astutely deals with commonly held beliefs about our human identity. From Selfie to Self Expression is an ambitious, cutting edge exhibition exploring technology’s democratisation of self-expression, while Self-Portrait as the Billy Goat compliments the latter by looking at contemporary works of self-expression through critical frameworks. Both encourage us to re-evaluate our most modern of weaknesses: the selfie. ISelf Collection: Self-Portrait as the Billy Goat runs at the Whitechapel Gallery, E1 7QX, until August 20. Entry is free. From Selfie to Self-Expression runs at the Saatchi Gallery, SW3 4RY, until September 6. Entry is free.